The city of Zhanjiang, Guangdong province hopes to further develop its friendship with the city of Geraldton in Western Australia, in a bid to strengthen the economic and cultural cooperation between the two cities, according to Zhanjiang Mayor Wang Zhongbing. Wang voiced his wishes during a meeting with Geraldton’s Mayor Shane Van Styn on Sept 19, during the Australian politician’s visit to the Chinese seaside city. 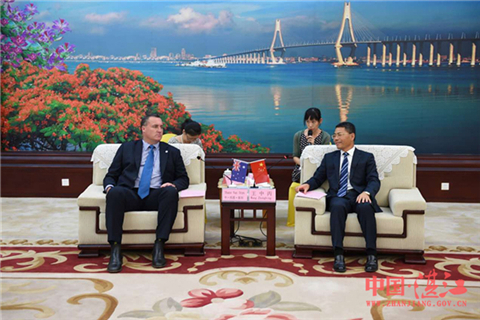 During the visit, Shane Van Styn said that both Geraldton and Zhanjiang have strong maritime industries, and that he looked forward to greater exchanges with the city’s enterprises. He expressed his desire for more cooperation on long-distance transportation and product processing. Wang said that he hoped more frequent exchanges between the two cities. The friendship between Zhanjiang and Geraldton began in 2007 and in 2013, the two cities signed a sister city agreement. 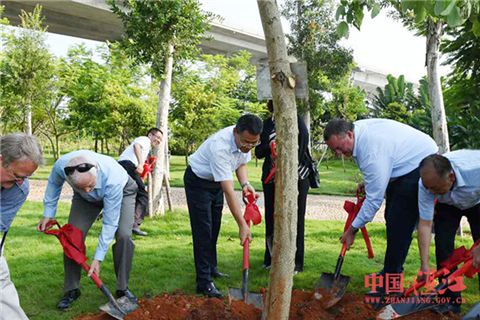 On Sept 20, Wang and Shane Van Styn went to the Sino-Australian Friendship Garden in Zhanjiang, and planted a Chinese redbud tree, symbolizing an ever-green friendship between Zhanjiang and Geraldton.